Thanks for joining for this weeks Glassie Monday. 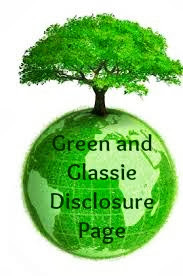 Each week I post info about glass. Last week I posted a pic of my Jager Tree to help explain COE of glass. I received so many emails about how do I make a Jager Tree. Well here goes....the journey of a DeDa Studios Jager Tree. 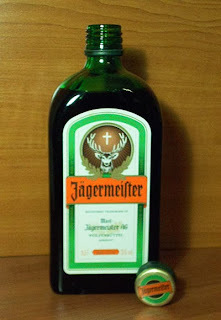 The 1st thing I do is get a Jagermeister bottle. I like Jager but no way do I drink enough to have bottles to make my trees. To get my bottles I have a arrangement with a few local bars. They save me Jager bottles in exchange for Jager Trees. the bottle removing all labels and glue. 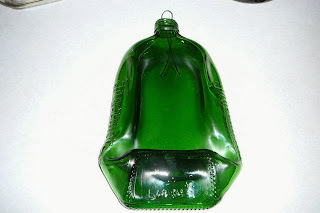 Then I break the bottle with a hammer in a cast iron skillet. When the pieces are broken I place all of the pieces into a old kitchen strainer and wash the glass. I then lay the glass pieces out to dry. Next is the designing of each tree. On my kiln shelf I start to arrange the broken pieces into the shape of a evergreen tree. I place a piece of copper wire in-between the glass pieces to form the hanger for the tree. I fill the kiln shelf with trees. When I have designed a complete shelf I place the shelf in the kiln and Tac the glass. Tac glass is the art of taking pieces of glass - form a solid piece and not lose the shapes of each piece. I explain to my customers by saying.... "I heat the broken pieces to a temp where I turn the glass surface into a glue and the pieces glue themselves to each other. At the same time smoothing out the edges so there are no sharp edges." This process of heating and cooling takes approximately 12 hours. Once they are finished I remove the trees from the kiln. I test each hanger to ensure it is secure then I tag and box the trees. 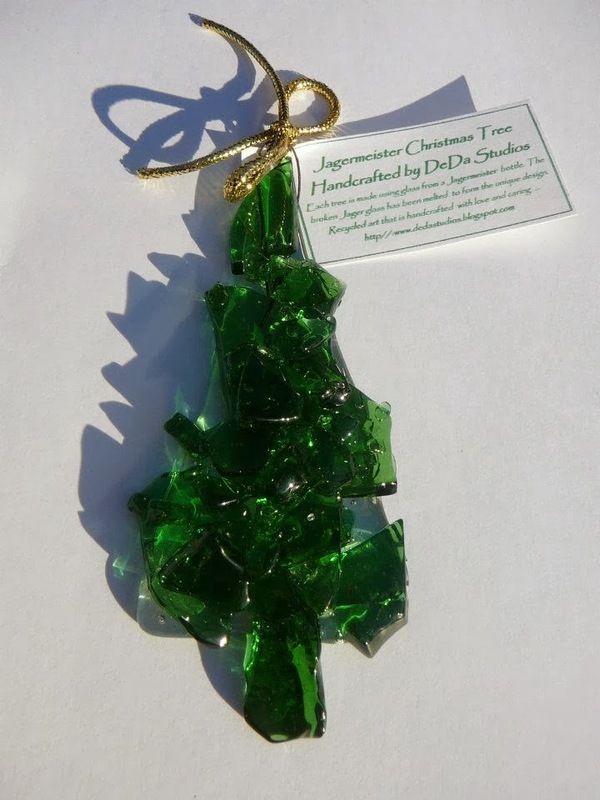 Each Jager Tree sells for $10 at art fairs and $10 plus shipping on-line. Shipping depends on the number of trees purchased. I can get up to 6 Jager Trees into a $5.20 Flat Rate Shipping Envelope (US only). Shipping overseas is more expensive and I cost out each shipping order. I never charge the customer more than shipping cost me. Each year I ship quite a few trees to Germany...the home of Jagermeister. There it is....the life of a Jager Tree. I also make Jager Jewelry, Serving Dishes, Wind Chimes and a collection of different slumped Jager's. This is a wall-hanging Jager Bottle before I placed the label back on the bottle. Perfect wall decor for a Man Cave!